Well, it’s been another week of illness for me, apologies if you were impatiently waiting for the usual pearls of wisdom to appear in your reader or inbox! Every so often I get afflicted with migraines, and can’t face opening my eyes, let alone typing stuff here. So, apologies for that. Hopefully, that’s the end of them, anyway! Today will only be a short post, anyway, before we get into the joy that is more awesome! Taking a look around online, seems like I’ve not really missed much at the moment. Some more game previews have gone up, for the upcoming The Road Darkens for Lord of the Rings LCG, which only looks at the boon attachments, most of which appear to be new versions of cards we’ve already seen. Also previewed was the third Force Pack in the upcoming Rogue Squadron cycle for Star Wars LCG, which I still don’t get to play, but it’s nice to see all the same. Something very exciting landed in my inbox yesterday – the Shadows of Brimstone pledge manager has finally gone live! It’s taken nearly ten months, but we’ve got there in the end. You may remember that I’ve backed this using two accounts? I received the invite for the account that was not over-pledged on, so that wasn’t as fun as I thought it would be. I have, however, been able to take some time to figure out what I’m going to spend my $380 over-pledge on, which is exciting! As an aside, I decided to start the #100happydays ‘challenge’ this weekend. It seems a tad silly to call it a challenge – as if you would ever have someone say “I challenge you to be happy for 100 days!”, but anyway. Day One was yesterday, so obviously, the SoB pledge manager was something to be very happy about! I think I’m largely going to confine it to tumblr, but perhaps spread it out across all branches of social media. Anyway, all of this is just an aside really, if you’re interested and whatnot! 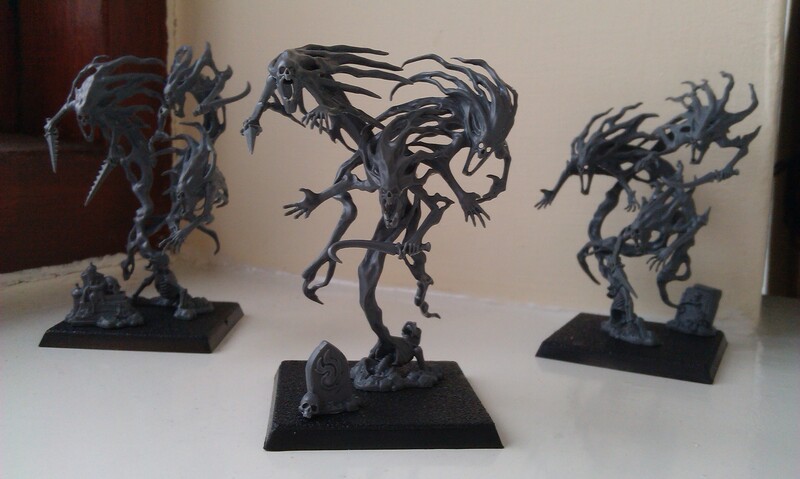 Yesterday afternoon was spent assembling the Spirit Hosts, however, largely because I took them out of the box to have a look at and then couldn’t get them back in! Some of the fiddliest models I’ve yet encountered, the central figure was just ridiculous! The spectral head on the right as you look at it was actually in three pieces, whereas others were in one. Quite why they felt the need to do this, I don’t know! Harumph. Anyway, I’m planning to paint them at some point in the coming week. They do look quite pretty, however, so that was an afternoon well spent! 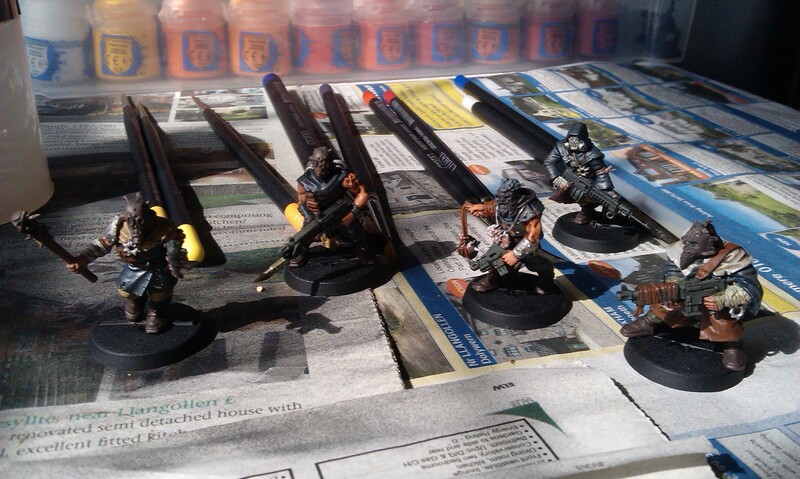 My most recent painting endeavour, anyway, was the box of five Chaos Cultists. Not half as fiddly as the Spirits, I’m not yet sure if I’ve finished them or not, as there are perhaps one or two highlights I might add, to the weapons and masks for instance. I also want to try out some rust effects on the weapons. We’ll see. A nice, cheap set, all told! I had a voucher with my online games store of choice, so have pre-ordered that Abyss game that I mentioned back when GenCon was kicking off. It looks beautiful, anyway, and post-voucher was very cheap, so I’m looking forward to that! Anyway, I’m going to sign off for now. Have a good day, everyone!